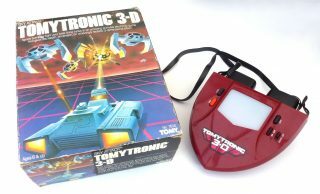 Handheld electronic games in the 1980s came in many forms but the Tomytronic 3D range were something a little bit different. There were 7 different versions released in the range all with similar gameplay, we’ve got our hands on a fully boxed 3D Sky Attack from 1983 which we’re going to put through it’s paces. Look at the shock and awe in his eyes…get yourself on eBay and that could be you. Like all of the Tomytronic 3D range to play 3D Sky Attack you had to look into the unit through eyepieces as you would a pair of binoculars. 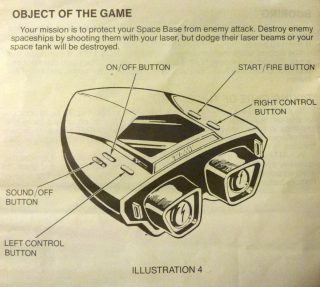 Your reward for this unorthodox means of operation was to be plunged into a three dimensional space battle where enemy bombers cruise overhead and rain down laser fire on you from above. Trust us, this screenshot does not do it justice. The affect was actually pretty good, it wouldn’t impress the cutting edge gamers of today with their Oculus Rift headsets but in it’s day it was the bee’s knees. It worked simply by giving each of your eyes a slightly different view of the same display which tricked the feeble human mind into experiencing a pseudo 3D effect. Combine this with having your entire eyesight taken up by the scene and the effect was complete…you could almost be there. 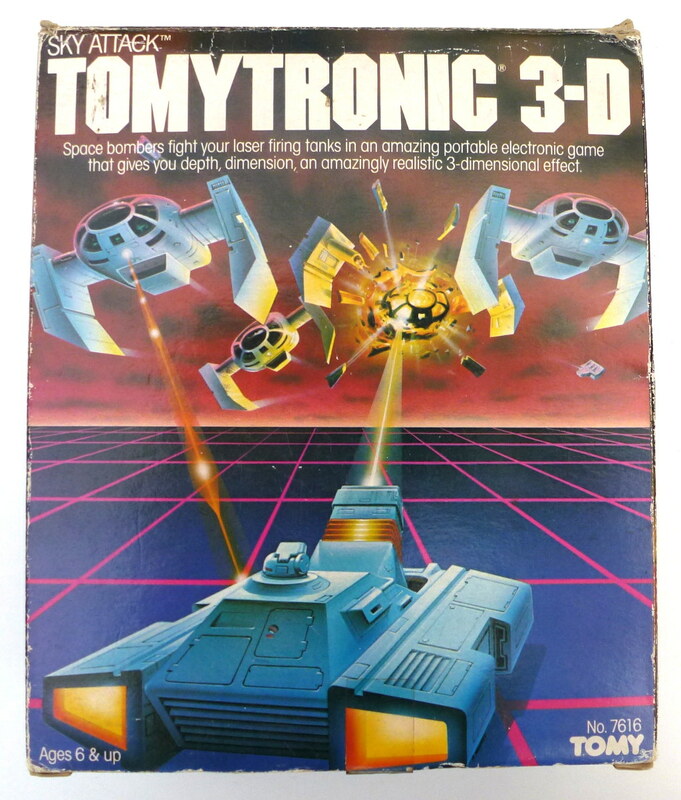 3D Sky Attack featured the standard shrill electronic bleeping sounds of the day which must have irritated many a parent on Christmas days throughout the 80s. Fortunately the sound could be turned off leaving just the faint and frantic clicking of button pressing to be heard. 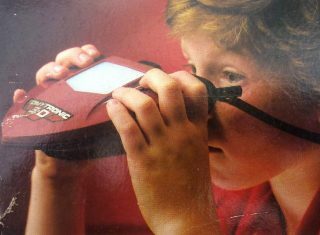 Any child hoping for a late-night-under-the-bed-sheets gaming session however was out of luck as the unit required a strong light source shining into it to make the display visible. The box art was clearly influenced by the popular media of the day looking like a cross between Star Wars and Tron. We fired up our 3D Sky Attack using the required 3 AA batteries and like Neo entering the Matrix we jumped straight in. 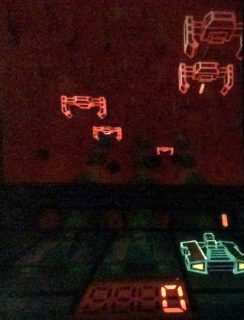 It’s a space invaders style affair with successive waves of enemy bombers emerging on the horizon and sailing over your head in majestic pseudo 3D. Your job is to blast them out of the sky before they have a chance to blow up your three remaining space tanks. If you avoid being blown up and shoot down enough enemies then you reach the end of the level. 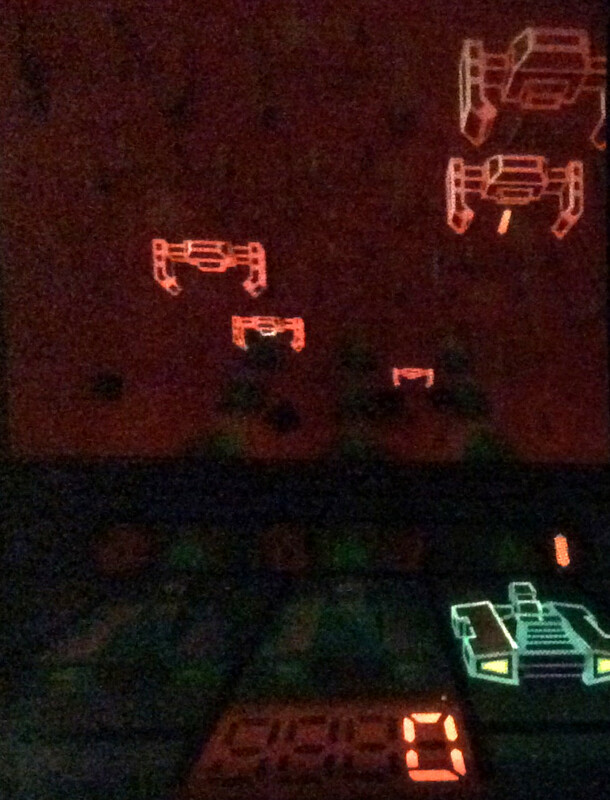 Between levels there is a special bonus level where super fast alien bombers power over at top speed. Hitting these with your laser cannon is hard but if you can pull it off then your reward is a massive 50 points. 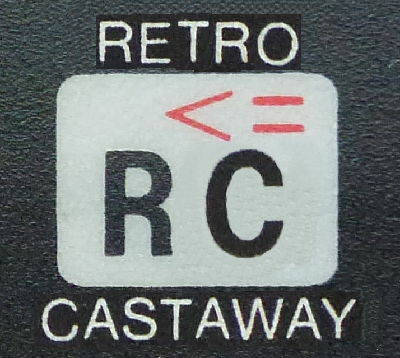 It’s an enjoyable game and is still satisfying to play even today with the 3D effect adding to the retro charm of the experience. It’s challenging as well with the aliens increasing in speed with each successive level driving you on in pursuit of your latest high score. If you fancy experiencing 3D Sky Attack for yourself then the good news is you can still easily pick these up on eBay for around £15 each (a little more boxed).